Bluapunkt have announced the TravelPilot Lucca 5.3, a portable GPS navigation system with ultra-fast route calculation and slim design. The TravelPilot Lucca 5.3 is the next generation of portable satellite navigation device from Bluapunkt. It features a very slim design, clear 4.3 inch display, colour coded menus, ultra fast route calculation and a range of driver assisted functions. Bluetooth connectivity is included to provide hands-free mobile phone operation. Destinations can be found using a full seven digit postcode search, street name or if the user prefers, they can enter the destination address via voice control. A "text to speech" feature is included that allows the Lucca to include the actual road name in the spoken instruction. For example, instead of saying "turn next left", it will say "turn next left onto Westway". This helps to eliminate one of the common problems with traditional navigations systems where the "turn next left" or "turn next right" instructions often end up leading the driver down a street that is not known by the navigation system. Blaupunkt have integrated navigation data for 40 countries in Europe into the system, eliminating the need to download this information to the unit. A wide range of multimedia and entertainment functions are also included with the TravelPilot Lucca 5.3 including the playback of MP3/WMA music files, digital photo and WMV video file support from an SD or MMC card. An optional Active Cradle is also available which provides connectivity for iPods, DVD players, TV tuners, gaming consoles etc. The Bluetooth connection also enables playback of MP3 files from the phone via audio streaming. Blaupunkt's suggested retail price is £349.99. Sony Ericsson have today anounced the MBS-100, a portable Bluetooth Speaker system featuring unique design. 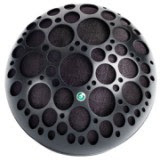 At a first glance you may be mistaken in thinking that Sony Ericsson have created a scale model of a crater faced moon, or perhaps Darth Vader's Death Star from Star Wars! What they have actually created is their first portable speaker system that can stream music wirelessly from your phone via Bluetooth. The MBS-100 is all about music on the move and has been designed for portability. It comes with an integrated rechargeable battery which means that you only need your phone and the MBS-100 to be able to listen to music wherever you are. Sony Ericsson also claim that the MBS-100 delivers a crystal clear, powerful sound using the latest A2DP (Advanced Audio Distribution Profile) Bluetooth audio streaming technology. Welcome! This post serves as an introduction to all of my "Insight" blogs on blogspot. I am a technology junkie who lives in the UK and have spent the past ten years of my life working as a software/electronics engineer. Recently my employment has required that I should keep up to date with the very latest mobile technology. Without going into the exact details of what I am working on, I will say that it involves quite a bit of Bluetooth and USB development. I decided that an online blog to would be a good way to keep up to date with mobile/Bluetooth/USB technology and remember any interesting news that I have discovered. I started out with the intention of running just one online blog through blogspot but that soon changed into three blogs when I realised that I couldn't categorise the content of my blogs. The three blogs that I am running are Mobile Insight, Bluetooth Insight and USB Insight. I intend to write about each topic at least once a week. If I get time, I will probably write more.